Alexander Reben wore a mask when he delivered a TEDx Talk in San Francisco earlier this month. 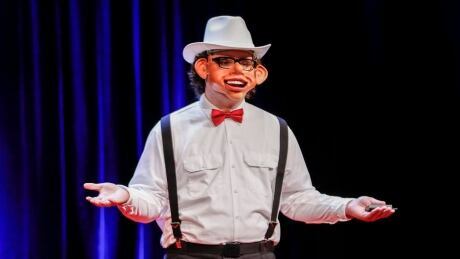 The mouth of the cartoonish face covering opened and closed as though in speech, but Reben, a roboticist at Stochastic Labs in Berkeley, Calif., didn't actually speak when he was on stage. Instead, Reben's TED Talk was made up of the sometimes inane, sometimes prophetic ramblings of an artificial intelligence text generator. "A lot of what the system spits out makes sense — if your stretch your mind a bit," he told host Brent Bambury. For example: "Radical ideas may be hard for everyone to register in their pants, generally. And there's a dolphin," Reben's machine said on stage. "I thought it would be interesting, instead of me talking about my work, to have a system actually create a TED Talk from scratch using these technologies," he told Bambury. The audience wasn't totally in the dark. Reben included a disclaimer that the speech was written by a machine. "I had a friend in the audience who described the reaction as befuddlement and quickly turning into humour," he explained. "Then people really got into it." The system is similar to Reben's fortune cookie generator, but instead he plied the algorithm with the text of TED Talks from months and years past. "The thing that's hard is to make a thread of a story, because the ideas change so quickly in this sort of output," he said. Reben's system produces seemingly disjointed thoughts like 'I am a bad situation' because it's able to recognize structure and syntax, but not necessarily appropriate word placement. The AI might flip some words around and come up with 'you'll never be happy.' It's still a fortune, but not the optimistic prophecy one expects after dinner. The limits of fortune or speech writing artificial intelligence aren't yet clear, Reben says. While you could feed a machine hundreds of poems, it would likely create something similar to what it has already read, instead of creating a fresh product. "What if you went even larger and trained it on literature, whether it be poetry or a play or a novel, and have it maybe invent a genre of writing that we've never seen before, haven't even thought about as humans," he asked. The challenge he's facing is that creativity isn't necessarily structured or logical, and Reben believes AI might hit a wall creatively. As it stands, humans are probably better served with an AI that recognizes stop signs in a self-driving car. "Or there could be some breakthrough where it makes poetry that we find awful, but may be stimulating for other machine learning systems which judge poetry." To hear more from Alexander Reben, or click the 'Listen' button at the top of this page.